The Microsoft Visual Studio Ecosystem team recently announced the Visual Studio Gallery web site: http://visualstudiogallery.com/. This web site is a central respository for Visual Studio extensions. It is possible for developers to add their own Visual Studio extensions to this site for others to access. The site however doesn't host the extensions, the site contains web links to where they can be found and information about the extension. 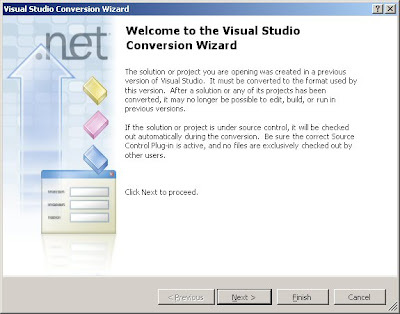 As the title says upgrading your pre 2008 device solutions to Visual Studio 2008 and to run under the .NET CF 3.5 is a two step process. This is because Visual Studio 2008 supports multi-targeting. 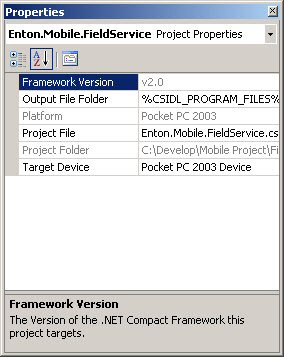 By default when you upgrade your VS 2005 projects to VS 2008 they continue to target the .NET Framework 2.0. This is true for both desktop and devices. This article quickly talks about how you target the new frameworks after conversion. 1. Open your VS 2005 solution in VS 2008. The conversion wizard will load, simply run though this. 2. This particular solution contains device projects as well as desktop projects. 3. As you can see, after the project has been converted, it is still compiled against the CF 2.0. 4. 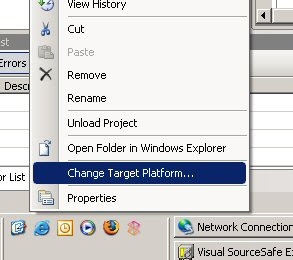 In VS 2008 there is a new menu option labeled "Upgrade Project" (among others) under Project or the same option can be accessed under the context menu by right clicking the project. NOTE: This new option is only visible to device applications. 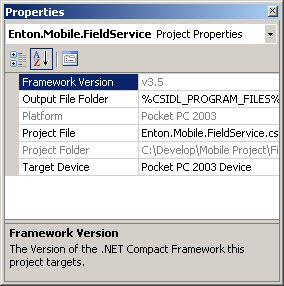 Clicking it will upgrade your Compact Framework 2.0 application to compile against the Compact Framework 3.5. 5. Clicking the "Upgrade Project" menu option will prompt you to continue. Once you have clicked Yes, the process is very quick and does indeed upgrade your device application to compile against the CF 3.5. 6. 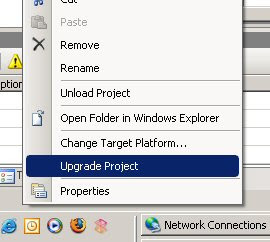 After doing the above you will notice the "Upgrade Project" menu option will disapear from the project context and main menus. Although this post is mainly about devices I thought I'd mention converting your desktop applications from .NET Framework 2.0 to .NET Framework 3.5 is slightly different. 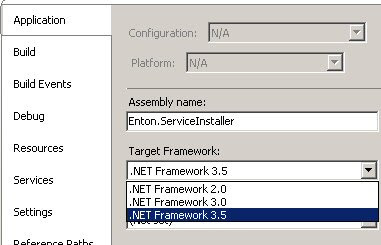 There is no "Upgrade Project" menu option for desktop projects, instead you have to use the muli-targeting support features under project properties to target the .NET Framework 3.5. In Visual Studio 2008 and the .NET Compact Framework 3.5, NETCF35.Messages replaces the System_SR found in previous versions of the CF. In Visual Studio 2008, this new cab that replaces System_SR is named: (NETCFv35.Messages.ENU.wm.cab for Windows Mobile or NETCFv35.Messages.ENU.cab for Windows CE) is not installed by VS initially when you start debugging whereas in pre VS 2008 we enjoyed the automatic install on debugging for the first time. You have to install this CAB explicitly. This cab can be found here: C:\Program Files\Microsoft.NET\SDK\CompactFramework\v3.5\WindowsCE\Diagnostics - of course assuming C: is where you decided to install the CF. I'll be attending the MVP Summit April 2008 in Redmond. Anyone else coming!!? ?